Wow it's been a crazy week here! I did want to stop by however and share this card with you. Supplies are SU cardstock in Chocolate Chip Rose Red, Garden Green and Barely Banana. Image is Sugar Nellie colored in with Copics and Bic Mark Its. Dots are Stamping Bella and the triangles are embossing with the Cuttlebug embossing folder Swiss Dots. Adorable card! Nice crisp clean style - and very attractive coloration! I love your card, great coloring! I just love your card! This is such a cute image and I love your colors! Great card...I loved your sketch challenge, just didn't get enough time to do it! Love the Bella dots!!! Oh how adorable- I love how you colored and the paper- works together so well. 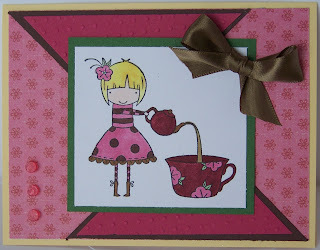 ooh, I love how you've layered the paper at a diagonal angle, this is such a cute card!